Welcome to the PotAter Patch ~: Still laughing!!! 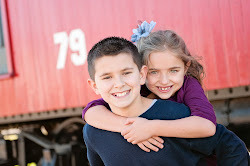 While we were at Mom and Dad's celebrating Christmas, we took family photos (thanks to my talented brother Matt). It was quite a photo session. Some of the photos we really good (see family picture in an earlier post) and some were just funny. Here's just one example. I think I'll post a picture or two everyday to show you what I mean. Its been a long time since I've laughed as hard as I did when this picture was taken. 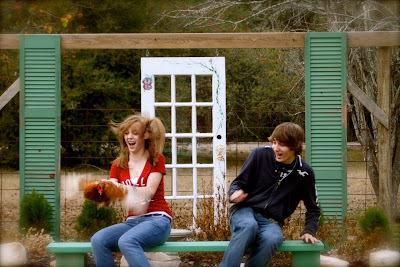 This is my older neice and nephew, Lyndee and Joey with one of Mom's way too friendly chickens. Lyndee was going to hold the chicken in the picture (we were making her because we thought it would be funny), when the chicken decided to take off and try to fly away. I laugh every time I see this picture...I think we all will for years to come. Lesson of the Day: When taking family photos...just keep clicking...no matter what happens.